Nikon: Z6, Z7, D90, D3100, D3200, D3300, D5000, D5100, D5200, D5300, D5500, D5600, D7000, D7100, D7200, D7500, D600, D610, D750, Df, D90 and COOLPIX P7700, COOLPIX P7800, COOLPIX A, COOLPIX P1000. The cord is 3.3' (1 m) long. Nikon DSLRs: D5 D3, D3s, D3x, D4,D4S, D200, D300, D300s,D500, D700, D800, D800E, D810 D850 ETC. Cable Shutter Release: Supports half-way focus and full-way shooting. Enhanced cable to be thicker. Cable length : 90 cm. D7000 D5100 D5000 D3000 D3200 D90 D80, D70S, D70, D60, D50, D40, D40X, P7100,P7700,P7000,P6000,8400, 8800, Pronea S. F75, F65, F55, N65, N75. Connectivity : Wireless. Lithium CR2025 battery (inside) x1. 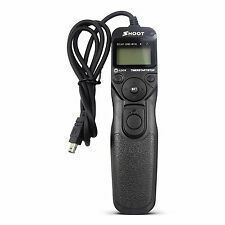 Wireless Remote Shutter Release. Color: Black. D750 D610 D600 D90 DF D7200 D7100 D7000. - Instruction manual. Trending at $16.98eBay determines this price through a machine learned model of the product's sale prices within the last 90 days. Nikon D90 D3100 D3200 D3300 D5000 D5100 D5200 D5300 D7000 D7100 D7200 D600 D90. storage&carriage box&case. Flash Trigger. stabilizer&support. The buttons can be operated with a single thumb. The LCD panel can also be illuminated. Baby & Mother's Toy. LENS Adapter. Beauty, Personal Health care. Nikon Coolpix 8400, 8800. Cokin Z Series Filter. LED video light. Studio Light Accessory. Upon first use. Compatible Model List (2 of 5) : D3400, D3300, D3200, D3000, D750, D610, D600, D90, D80, D70, D70S. Compatible Model List (1 of 5) : D7500, D7200, D7100, D7000, D5500, D5300, D5200, D5100, D5000. Compatible Model List (5 of 5) : Nikon 1 J1, Nikon 1 J2, Nikon 1 V1, Nikon 1 V2, Nikon 1 V3. Compatibility: Nikon Digital. "EXCELLENT CONDITION.". 80 to 89 percent of original. Shows moderate wear for the age of the item, with the possibility of small dings or blemishes. Glass may have slight blemishes but will not affect picture quality. Trending at $10.11eBay determines this price through a machine learned model of the product's sale prices within the last 90 days. For vn-500 Nikon Camcorder. Nikon RMT-502N Remote. Tested to work. Nikon ML-L3 w/ battery and the Amazon Basics B003L1ZYZ6 w/ battery (the 1 battery is like new). Manufacturer: Nikon. With our dynamic pricing model, our prices are always competitive. Item part number: 4730. Item MPN: 4730. The WR-T10/WR-R10 units use radio frequencies to communicate; by pairing together a WR-T10 and one or more WR-R10 units. Nikon WR-T10 is compatible with the following models Three radio frequency channels are available for use, to prevent interference when multiple pairings or photographers are shooting in one location. Nikon ML-1 TRANSMITTER. This ML-1 has been tested, is working as it should, see indicator lamp. 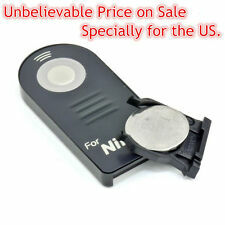 Genuine Nikon MC-12B Shutter Release Remote Cord for F4s, N70, F70, N2020, F-501, N2002, F-301, N8008, F-801, N8008s, F-801s, and MD-12 & MD-4 motor-drives. This item is fully functional. See photos, what you see is what you get. Requires the CR2025 battery. Not limited to compatibility with Nikon D5200 D7100 D3200. 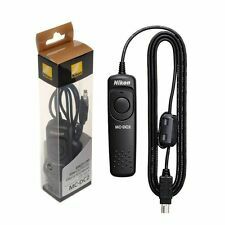 Genuine Nikon MC-12B Remote cord. Condition is Used. Shipped with USPS First Class Package. I will not declare the item as a gift. The original battery is included but may not be good. It's pretty old. The box and instructions are included. The remote cord is in perfect working condition. Compatibility: Nikon N90/S,F100,F5,F6,D300,D3. Model: ML-3. "EXCELLENT PLUS " rates 90 to 96 percent of original condition. Exceptionally nice, but may have slight wear on finish visible only under close inspection. 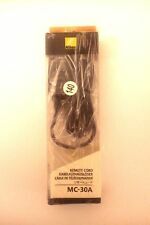 Genuine Nikon MC-20 Remote Cord, serial number 287764, NEW in box with pamphlet. Features trigger-lock function, and is 2.6 ft (80 cm) in length. New Genuine Nikon Item in original Nikon box. Nikon ML-L2. You are responsible for them and we do not know how much they will be! There may be. Local pick-up is possible. Check or ask for rates! This is a genuine Nikon product, not an inexpensive knock off. The remote works great and has been very lightly used. Nikon MC-25 Remote. Compatibility: Nikon Manual Focus. Photos are a representation of the actual item. "EXCELLENT CONDITION. ". 80 to 89 percent of original. Shows moderate wear for the age of the item, with the possibility of small dings or blemishes. 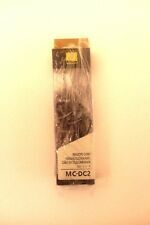 Nikon MC-12B Remote Release Cord. Tested working correctly, very clean, no scratches or scuffs. COOLPIX P7700. COOLPIX P7800. COOLPIX P900. Nikon 1 J1, J2, V3. (Takes a CR2025 3V button battery). 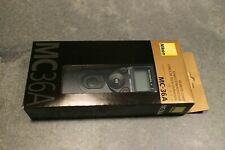 Nikon Remote Cord MC-22, 10 pin w/banana plugs (39.4in), NEW in box with pamphlet. This application is suitable for wildlife and surveillance. In an effort to prevent inadvertent crossover with other devices, there are 2 channels to select from. Both can easily be selected on the transmitter and receiver. Nizo, Eumig, Canon, Bauer ETC. ML-1 has a Transmitter unit and a Receiver unit. Nikon MC-30 Remote Cord. Made in Japan. It's in excellent condition. 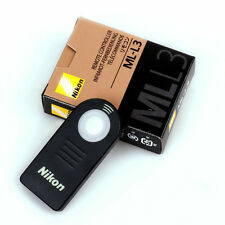 Genuine Nikon ML-L3 Infrared Remote Control D7500 D5500 D3400 D750 D610 etc. 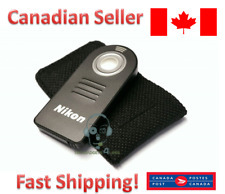 This is a genuine Nikon product, not an inexpensive knock off. The remote works great and has been very lightly used. Fits Coolpix MODELS. THESE ARE REAL/ORIGINAL NIKON USA PRODUCT. NIKON USA PRODUCT. We are an Authorized Nikon USA Dealer! We are a Nikon USA authorized dealer. This is a used/surplus item unless stated above. Very lightly used. Toys, Kids & Baby(62). ☆ Number of radio channels: 5 ch (2.425 GHz), 10 ch (2.450 GHz). ☆ Number of radio channels (continued): 15 ch (2.475 GHz). New Arrivals. Other(262). Car & Motorbike(4). Automotive & Industrial(9).